Folly Cove reviewed by Jennifer S. Brown. Rarely do I read a book in a single day, but Folly Cove absolutely captivated me. Maybe it was because I saw my own relatives in these characters (Sarah reminded me of my own grandmother), but this story about three sisters and their mother gripped me. 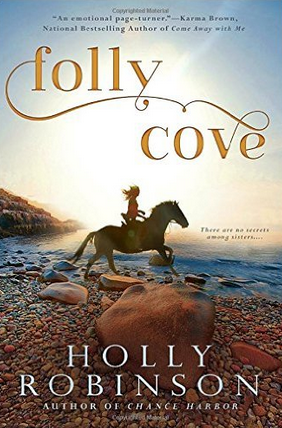 Folly Cove is an old inn in Rockport, MA, run by single-mom Sarah and her three daughters, at least until two of the daughters are old enough to escape. The third daughter married, had a child, and settled in to continue helping out. At the start of the novel, however, the two other sisters are pulled back to Folly Cove, and all three must work together–despite that not all are speaking to one another–to plan their mother’s birthday. I didn’t want to put this book down so I could find out what all the secrets are–and there are plenty of secrets to be uncovered. Robinson’s writing is gorgeous and her descriptions are spot on. In describing an older couple staying at the inn, she writes, “They looked like a pair of pigeons mated for life.” So evocative! I thoroughly enjoyed Folly Cove. Jennifer considers herself a Floridian, having moved to Miami as a three-year-old and spending the majority of her formative years in Miami Beach. But then again, she’ll also identify as a New Yorker after earning a BFA in filmmaking from New York University and sticking around the City to work in publishing and—for a very brief stint—at a talent agency (and to be technical about it, she was born in New York City). Her passion for Seattle developed when she earned her MFA in creative writing from the University of Washington and then settled into a job as an editor at, what was then billed as, “that little online bookstore,” aka Amazon.com. She now lives and writes in the suburbs of Boston.